One of the most popular video slots in the UK. Dates back to 2005, making it one of the first online slots to hit the casinos. Consistently ranks in the top three at Paddy Power Games, as well as other prominent new casinos like Casinopop and Rizk. 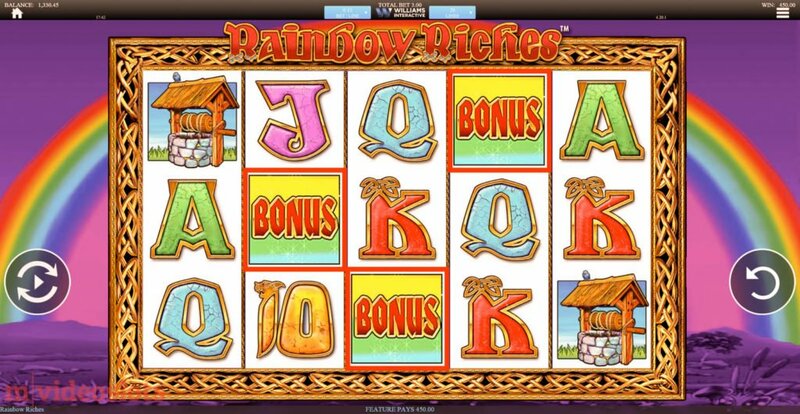 It’s the ever-popular 20-line Rainbow Riches from Barcrest and it has 3 bonuses to spike your attention. 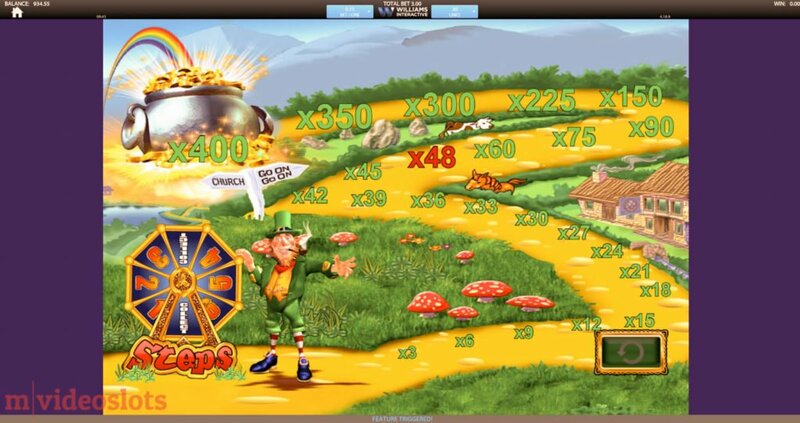 If you’re up for a pot of gold like the Leprechaun, then here’s how to claim one that’s worth up to 500x the total stake, betting just 20 cents (or pence) per spin. Wishing Well bonus — click on Scatters to win up to 500x the total bet. In this luck of the Irish game, every spin sounds like someone’s sprinkling magic dust over the 5 reels. And there’s a good reason for it – to help you squeeze every bit from the game and its stacked high-value Logo symbols. They pay up to 12.5x the total stake (for 5 of a kind) and come along with Wilds (Gold Coins) that are valued at double as much. Note: Other than the above and the 3 special Scatters, the Rainbow Riches mobile slot has just 5 low-value playing card symbols. One of such Scatters is the Wishing Well symbol, which triggers the corresponding bonus when 3 or more of such land on the screen in one spin. The more the better. Once the bonus is on, the symbols start flashing Pick Me. Just pick them to reveal multipliers, which will definitely be between 2x–500x the total bet. And that’s just to start with, as there’s much more to come. Road to Riches board game bonus for wins of up to 500x the total stake. Although there’s no Free Spins in the leprechaun slot, meet the most interesting feature in the Rainbow Riches mobile slot, called Road to Riches bonus. To win it, look out for 3 or more of the Road to Riches symbols with the Leprechaun to win the feature. The game will then take you to another screen with a path to better multipliers (see screenshot). Instead of dice, you spin the wheel at the bottom left corner. There are 8 positions or steps on the wheel, that include numbers from 1 to 6 and two Collect sectors, which end the feature. To win the jackpot of 500x your total stake, make 24 steps on the path without landing on the Collect sector. Easy as that. Note: The more Bonus symbols you trigger on the screen the better the multipliers on the path. For example, for 3x Bonus symbol, the maximum multiplier will be capped at 200x, whereas for 4x Bonus symbol it’s increased to 400x, etc. 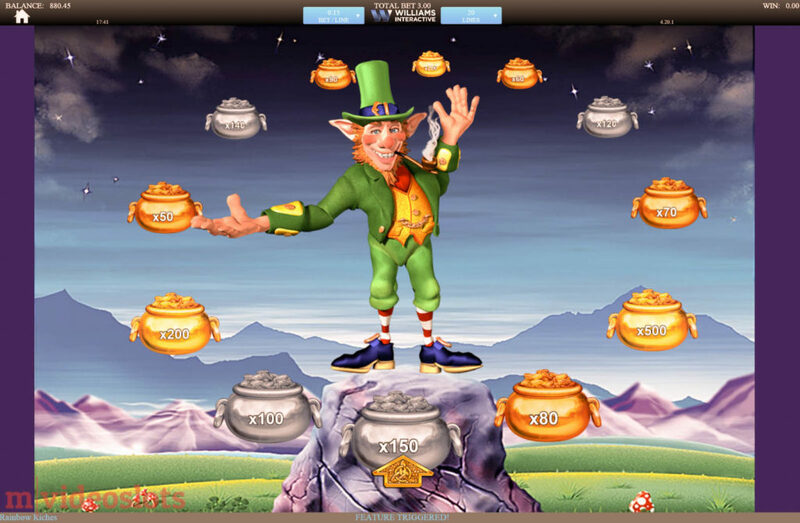 If that’s not enough, see Microgaming’s Lucky Leprechaun slot, with exactly the same bonus but a jackpot that reaches 1,000x the total bet, which is available at Casinopop. Here’s the second and final way to hit the jackpot. Pots of Gold bonus for a minimum win of 50x the total stake. 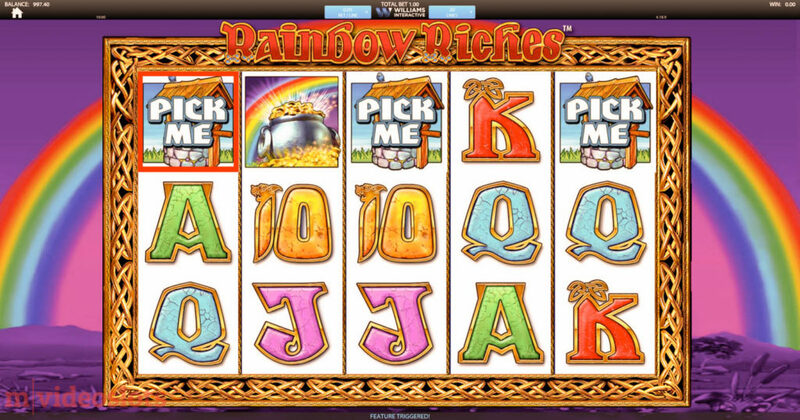 The fun continues with one of the rarest features in the Rainbow Riches game, which is called Pots of Gold. To make the pots come alive, you do need exactly 3 Pots of Gold symbols. The same Leprechaun will then take you to yet another bonus screen with lots of gold, silver, and bronze pots spinning around. Below him there’s one tiny arrow that will decide your fortune. And the best part is that the minimum win possible in this bonus is a whooping 50x the total bet. Without getting too greedy, the highest possible win is also set to 500x the total stake, as with the other two bonuses above. Similar payouts can also be found in Play’n GO’s Leprechaun Goes to Egypt, which is also available at the new Casinopop. Play Rainbow Riches mobile slot at Casumo, for free or real money. One of the reasons for the Rainbow Riches success is that it’s been around for ages. And because Barcrest knows how to create quality slot machines. Wishing Well Bonus – 3x Wishing Well symbols trigger pick-and-win game for returns of up to 500x the total stake. Road to Riches Bonus – get 3x Road to Riches Scatters in one spin to win an interactive board game bonus for wins up to 200x, 400x or 500x the total bet. Pots of Gold Bonus – get 3x Pots of Gold Scatters and win a feature with a minimum win of 50x the total bet. Sounds good? Play Rainbow Riches for free or real money, also found on Rizk and Casinopop. For more slots from SG Interactive, see the extreme-risk Raging Rhino, with 4,096 ways to win and a Free Spins bonus with x2 and x3 Wilds. How about some more of the luck of the Irish? Rainbow Riches fan or not, SG Interactive has released the Rainbow Riches Pick ‘n’ Mix, which has a ton of new features, like the Big Bet game and Free Spins. If you’re out of this world, then how about 100 lines on Colossal Reels? Look for Rainbow Riches: Reels of Gold at Casumo, which is absolutely mad.